The rain has come, when it does most fly fishermen turn to their nymph rigs. You don't have to if you change your Spey setup. This is the set up that has worked well for me. Hope it helps! 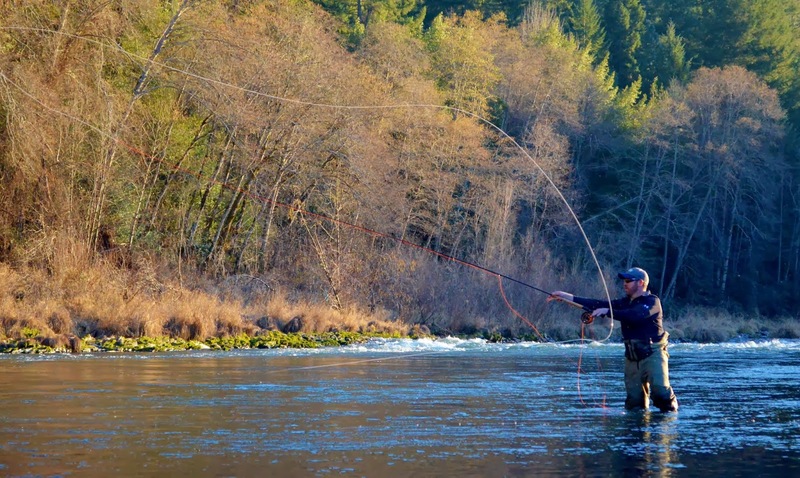 Winter Seam Fishing, Rogue River Style! 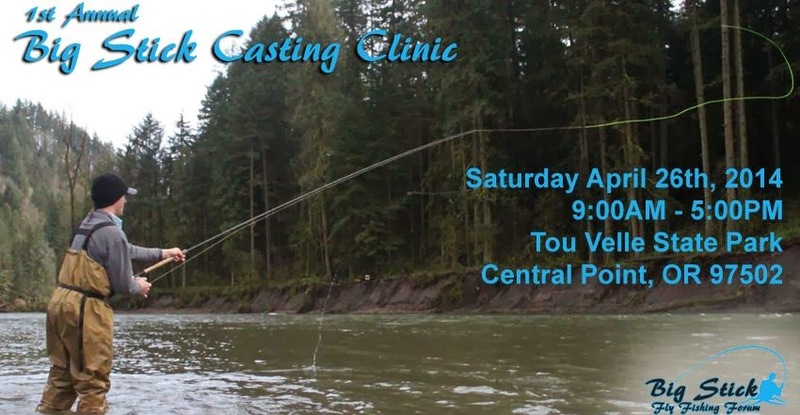 Wanna Learn how to Spey Cast? Or learn how to present your fly in the swing? Come out! If you are new to the sport or have been at it for a while come to Tou Velle Park on April 26th, of this year! 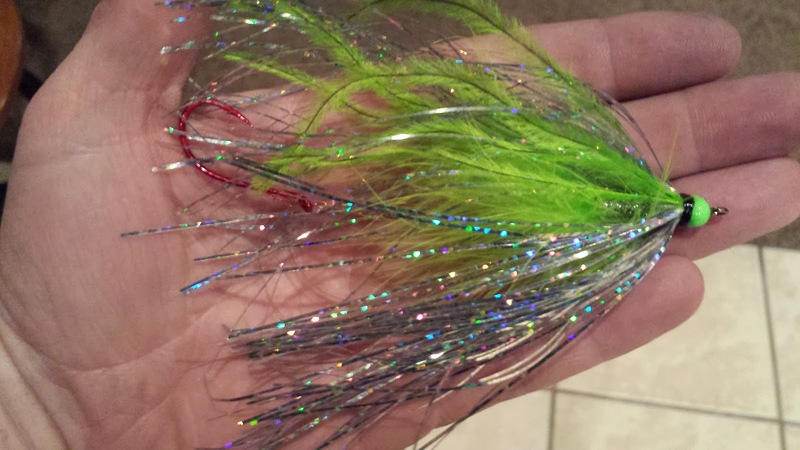 Big Stick Forum will be putting on a clinic for ALL Spey casters! Stay tuned more presenters will be announced. Go here Big Stick Casting Clinic to keep up with whats going on. The folks at Fish! On let me play with the LTS 9126 Explosive's brother the LTS X1. The LTS team tried to make a high performance rod that would fit anyone's style, and I think they have done quite well. Check out my Video report on this fun Rod! Labels: LTS X1, Rogue River Spey, Rogue River Spey School. Ok, if any of you have followed me for a while you know that I have a passion that I haven't filled yet. After 43 years on God's green earth, I have yet to hook and land a up river, Rogue River Springer on a fly. I have hooked them, mostly by accident, but I haven't even came close to landing one yet. Part of the reason for this is that I haven't had enough practice. Part of the reason I haven't had enough practice is that my average hook up, to year, ratio is .0008 to one. Part of the reason for such a low hook up rate is that I think my fly is fishing where the salmon hold, about .053 seconds out of every 8 hours on the river, due to the high spring run off associated to these jems of the northwest. This year is different, 2014 will be the year this passion will be filled, because I have came up secret weapon number 57. With olé 57 I have a hypothesis to prove, but if I learned anything from 2 to 56, and kindergarten, it's that you have to keep your fly down...maybe I have the kindergarten lesson backwards...anyhow if you are going to catch a Chinook you have to be on the bottom. That's where olé 57 comes into the picture. Olé 57 is a fly I would like to call Slowfish...kinda named after the lure with the exact opposite name...The Slowfish will get down. The Slowfish is as big as my hand and made out of materials that allows it to be casted with something slightly less than a crane, but I guarantee it will get down. Like all my other secret weapons I have yet ti iron all the details out--like will graphite hold up to the strain of a Mack truck, as studies have shown that is the equivalent resistance that this fly will place on any rod: And if so how much of the river will it take with it. I am also a bit leery of packing the rod that this beast will require, as I'm afraid that much graphite whipping around in the atmosphere might alter the signals from the GPS satellites, sending our Air Force to attack Fiji instead Afghanistan- I kinda like Fiji! What's that? You want to know about secret weapon number 1. Oh we don't talk about that around here. It's mere mention, creates hate and discontent around my house, as we haven't been able to handle our house cat since...even to wash the Chartreuse dye out. So, go ahead and copy this pattern if your man enough. Secret No.57 the Fly Known as Slowfish!